Engine lubrication is a circulating system. A gear-type feed pump (OJH.V. Engine) or a vane-type feed pump (Side Valve Engine), draws oil from the tank and delivers it to crankshaft under pressure. Pressure can be regulated. A gear-type scavenger pump returns oil from engine base to tank. OJi.V. 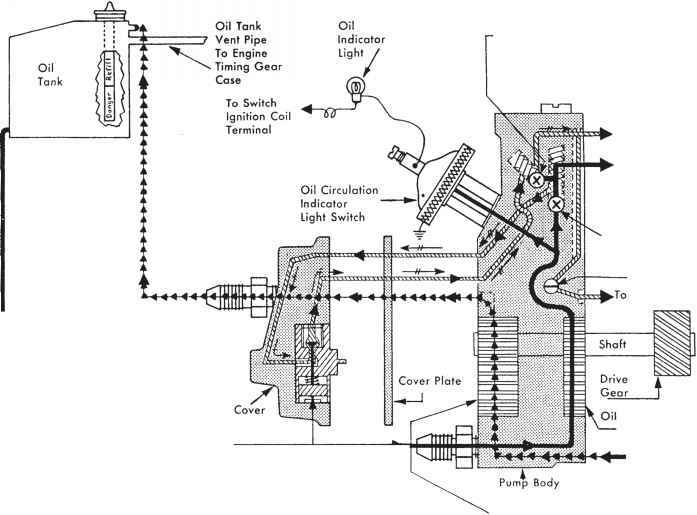 Engine: Refer to schematic diagram of oil pump, Illus. 23, and engine oiling system, Illus. 22. 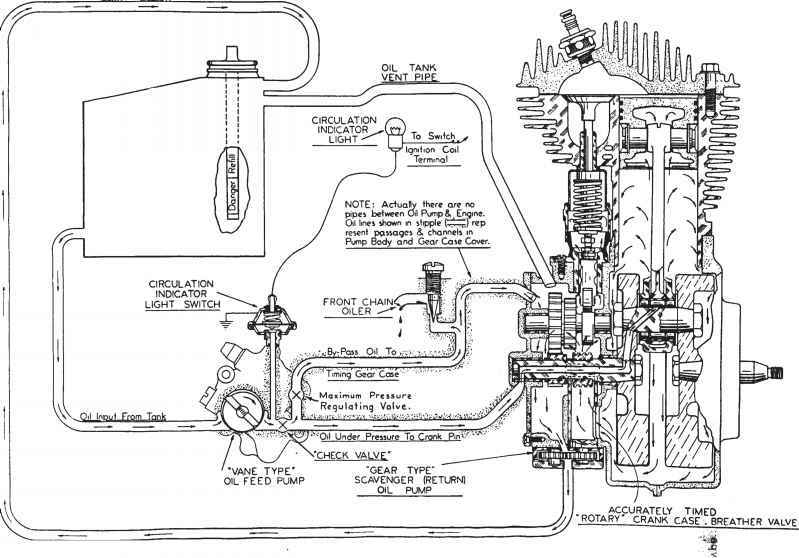 Side Valve Engine, 1940 and Earlier Models: Refer to schematic diagram of oil feed pump, Illus. 25, and engine oiling system, Illus. 24. Side Valve Engine, 1941 to 1947 Models: Refer to schematic diagram of oil feed pump, Illus. 26, and engine oiling system, Illus. 24. A motorcycle engine being air cooled requires a high quality lubricating oil. O.H.V. Engine: Use Harley-Davidson "Medium Heavy" oil above +10° F.; Harley-Davidson "Light" oil, when predominating temperature is +10° F. or colder. Side Valve Engine: Use Harley-Davidson "Regular Heavy" oil above +32° F.; Harley-Davidson "Medium Heavy" oil +32° F. to +10° F.; Harley-Davidson "Light" oil when predominating temperature is +10° F. or colder. All Models: If winter weather becomes so ex tremely cold that "Light" oil congeals in tank, add just enough kerosene to keep oil fluid. Tank competely empty holds one gallon. About one inch from top of tank is considered full. Don't fill above this level, as tank needs some air space. Tighten cap securely to prevent leakage. Oil circulation is indicated by oil signal light in instrument panel going "OFF" when engine is running. Oil mileage normally varies from 250 to 500 miles per quart depending on nature of service, solo or sidecar use, fast or moderate driving, and condition of engine as regards both timing and wear. If mileage is not within this range, engine may need attention, or oil pump may need adjusting, see "Adjusting Oil Feed Pump," Page 28. Remove oil tank cap (gauge rod attached) and check oil supply not more than 300 miles after each complete refill. Unless oil is added to bring tank oil level to full mark each time oil is checked, more frequent checking than 300-mile interval mentioned above will be necessary to avoid any chance of tank running dry. When level is down to "refill" mark, 2 quarts can be added. Oil supply runs cooler and mileage somewhat higher with oil level well up in tank. When a new engine has run its first 750 miles, and normally in warm or hot weather and in average service, at about 2000 mile intervals thereafter, completely drain oil tank of used oil and refill with fresh oil. If service is extremely hard, or dusty service on dirt roads or in competition, drain and refill at shorter intervals. Draining should be done after a run while oil is hot. It is not necessary to drain crankcase as it does not accumulate used oil. At the time of the first 750-mile oil change, and at least with every second oil change thereafter, thoroughly flush and clean out oil tank with kerosene. This will remove any sediment and sludge that may have accumulated. Winter Caution: Water is a by-product of combustion in any internal combustion engine. In a condensed state, the water vapor formed would equal approximately the quantity of gasoline burned. Some of this water vapor escapes past the rings into the crankcase. When starting and warming up in cold weather, especially in freezing or colder weather, considerable of the vapor that gets into crankcase condenses to water before crankcase is hot enough so that it no longer acts as a condenser and exhausts the vapor, without inside condensation, through outside breather. If engine is driven enough to get crankcase thoroughly warmed up frequently, most of this water is again vaporized and blown out through outside breather. However, a moderately driven engine, making only short runs now and then and seldom thoroughly warmed up, is likely to accumulate an increasing amount of water in oil tank. This water will, in freezing weather, become slush or ice and, if allowed to accumulate too long, may block oil lines with resulting damage to engine. Also, water mixed with oil for some time, forms a heavy sludge of considerable acid content that is very harmful to bearings and other internal engine parts. To sum it up briefly, an engine that is used only for short runs during freezing weather requires frequent oil changes along with thorough flushing of tank to remove any accumulated sludge. Therefore, in winter the oil change interval should be shorter than normal for all engines, and any engine used only for short runs, particularly in commercial service, must have oil changed frequently along with a thorough tank flushout to remove any water and sludge, before new oil is put in tank. The farther below freezing the temperature drops, the shorter the oil change interval should be. system, and oil feed pumps will enable you to trace feed oil and return oil in this type of engine. What is Harley Davidson Medium Heavy motor oil? What oil change a Harley Davidson? How oil pump circulates the oil in the engine? How is harley engine lubricated?